Bacon. Cheese. Potatoes. Need I say more? This Easy Crock Pot Cheesy Bacon Ranch Potatoes recipe only requires a few ingredients and makes a delicious side dish that your entire family will love. I go weak in the knees over potatoes. From potato chips, to French fries, to homemade creamy mashed potatoes, to cheesy bacon ranch potatoes… I don’t care how they are made; potatoes are my favorite indulgence. In fact, if I had to choose between cake or a tasty potato side dish, potatoes would win every time. Besides being a delicious staple for every cousin around the world, the round little convenient food crop has unlimited possibilities for cooking. Potatoes USA has an incredible assortment of yummy potato recipes to inspire you for your next meal. 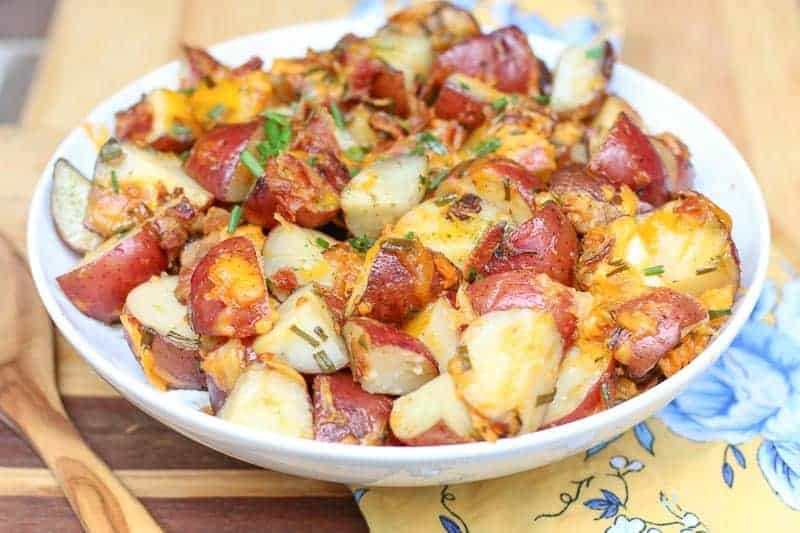 Some of my favorite recipes are their Tuscan-Herbed Potatoes, Chorizo Stuffed Potatoes, Potato and Eggs Bene-Chick, and Greek Pita Salad with Potatoes. Be sure to follow them on Facebook to get updates on all of their latest recipe additions! My daughter loves these slow cooker cheesy ranch potatoes with crispy bacon. The minute I started cooking the bacon, she popped her head in the kitchen and said, “I smell bacon!” I had to keep slapping her hands to keep her out of my cheese and bacon. She kept impatiently returning to the kitchen as it cooked to ask, “Mom, is it ready yet?” She was so excited to have these cheesy ranch potatoes with her meal. The Crock Pot Cheesy Bacon Ranch Potatoes are easy to make. 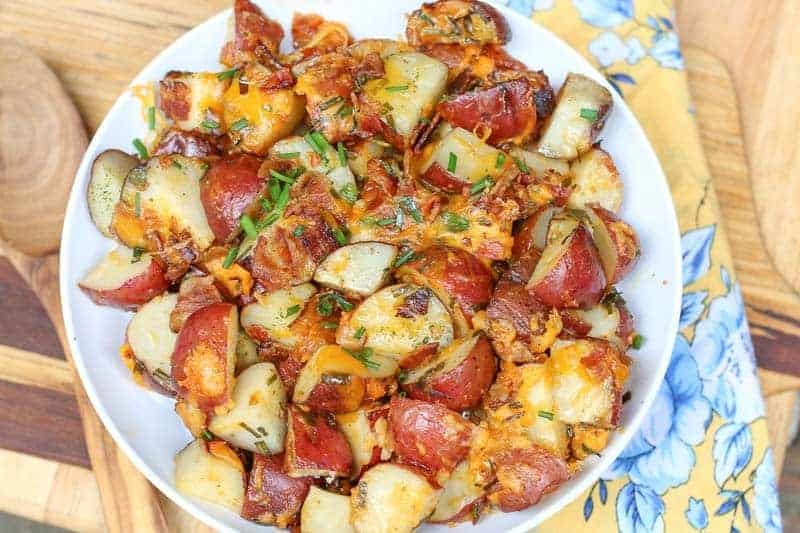 I use the petite red potatoes because their sweet flavor compliments the salty bacon and cheese. When cooked properly, they are incredibly tender. Cut the petite red potatoes to a quartered size. If you use a larger red potato, cut them into small quartered pieces to cook faster and evenly. Cover the inside of your crock-pot with a large piece of tinfoil. It will need to be large enough to create a foil packet to cover the potatoes entirely. Next spray the foil with cooking spray to prevent sticking. You will layer the ingredients, then close the foil and seal it. The foil will make your crock-pot easy to clean up. It will also steam cook the potatoes, making them fork tender and soft. Next, close the crock-pot with the lid to retain the heat. Walk away and in 4 hours you have one yummy potato dish!! *I use store bought dry ranch salad dressing mix. This is a homemade dry ranch dressing mix if you want to make your own. 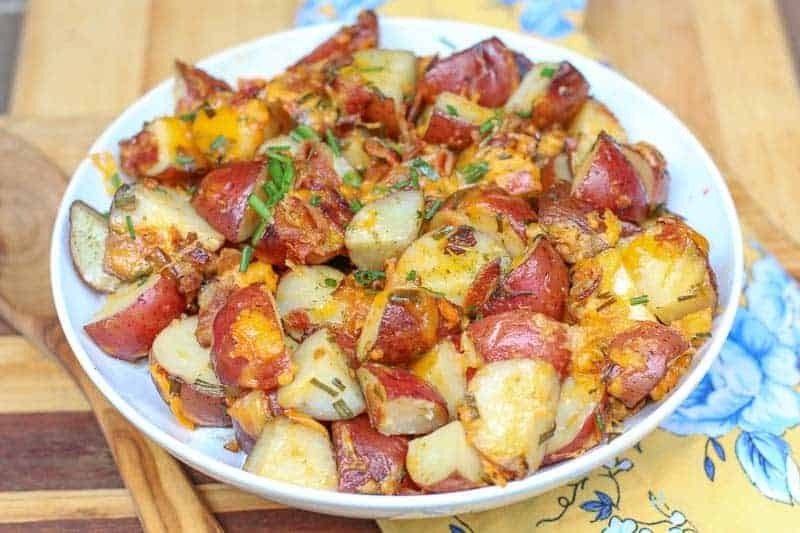 For more potato recipes, check out: Moroccan-Style Crispy Roasted Potatoes, Greek Lemon Potatoes, and Bacon Ranch Potato Salad. Line your crock pot with aluminum foil leaving enough to cover the potatoes completely. Spray aluminum foil with non stick cooking spray. Layer half of the potatoes and sprinkle half of the dry ranch salad dressing mix to coat the potatoes. Top with half of the bacon, cheese, and chives. Add the remaining potatoes and cover with remaining dry ranch salad dressing mix. Top with remaining bacon and cheese, reserving 1/2 cup cheese and 1tablespoon of bacon. Add remaining chives, reserving 1 teaspoon. Cover and close tinfoil making sure to seal all openings. Close Crock Pot with lid. Cook on high heat for 3 to 4 hours until potatoes are fork tender. Cover with remaining cheese and bacon. Cover and seal, cooking an additional 2 minutes for the cheese to melt. Cover with remaining chives and salt and pepper to taste. Serve. Glad it turned out good. The substitutions do sound tasty. I just made this with the following substitutions: Instead of regular ranch dressing mix, I used the spicy ranch dressing mix, and since I am not a fan of chives but adore garlic, I used 2 good-sized cloves of garlic sprinkled over each layer of potatoes (4 total), followed by the dressing mix, cheese, and bacon bits, respectively. I was also running low on shredded cheddar (only ~1.5 oz left over), but had a whole bag of a shredded Mexican style mix of four cheeses that I supplemented for the rest, mixing in half the remaining cheddar with each layer. It turned out DIVINE! I don’t know, but I don’t believe it would be as good reheated. I’m making this for Christmas is it possible to cook the night before (Christmas Eve) and reheat it on low in the morning? I guess it would depend on the size of your crockpot. I would think you would have no problem doubling it. I am not sure at all about tripling it… I would think you would not have room. As far as the time, I would think 4 hours should still do it. I haven’t doubled it, so I don’t have the experience to be sure. You might want to allow an extra hour just in case. If they are done early, you can just keep them covered in the foil in the warm setting until ready to serve. You can add in all the toppings, just don’t add the green onions until you are ready to serve. 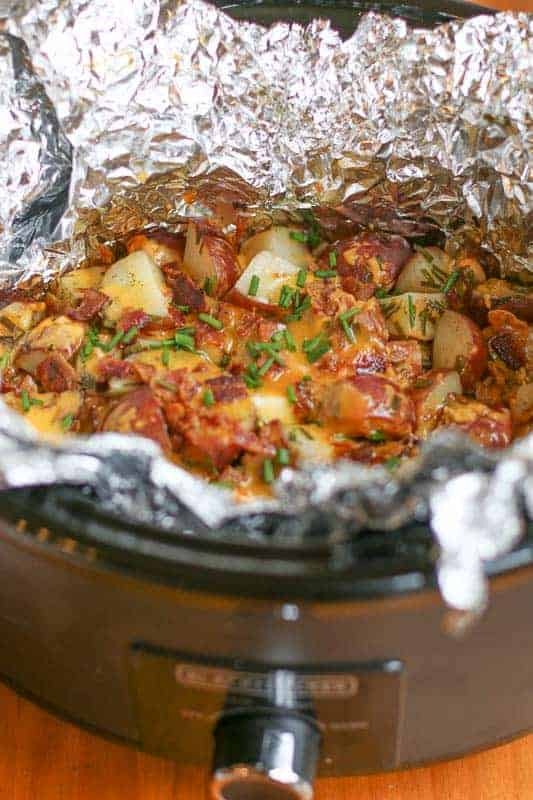 If I am wanting to make this for a larger crowd and double or triple the recipe could I do it all in one crockpot if it fits and would the cook time still be enough to cook the potatoes completely? Can’t wait to make this for Father’s Day tomorrow! Going I try a little less cheese than called for and a dash of garlic powder….you can never go wrong with garlic! Yes you want to line the crockpot with foil. You want the foil to completely cover the potatoes so it will steam cook them. It will also make clean up a breeze. Is it necessary to line the pot with foil? Looks like a yummy recipe.